George Brett is in his 25th season as the Royals’ Vice President-Baseball Operations, continuing his long-time association with the organization. George Brett is in his 25th season as the Royals’ Vice President-Baseball Operations, continuing his long-time association with the organization. The 64-year-old Hall of Famer, who was selected by the Royals in the second round of the 1971 June Free Agent Draft, spent his entire big league playing career in Kansas City before moving into the front office following his retirement in 1993. During the 2013 season, Brett took on the role of interim hitting coach, being named to the position on May 30. He served in that capacity until July 25, when he resumed his role as Vice President-Baseball Operations and Pedro Grifol was named full-time hitting coach. Brett was inducted into Baseball’s Hall of Fame in July of 1999 after receiving 98 percent of the votes, the sixth-highest mark in history. He played 21 seasons for the Royals, collecting 3,154 hits, three batting titles (1976, 1980 and 1990) and a Most Valuable Player Award (1980). The Royals retired Brett’s number 5 and inducted him into the club’s Hall of Fame on May 14, 1994. 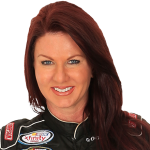 Brett is involved in numerous charitable causes as well as several enterprises. 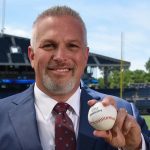 He and his brothers own Brett Brothers Sports International which manufactures bats, gloves and other baseball equipment. Brett Brothers also own interest in several professional teams. George and his wife, Leslie, have three sons: Jackson, Dylan and Robin. 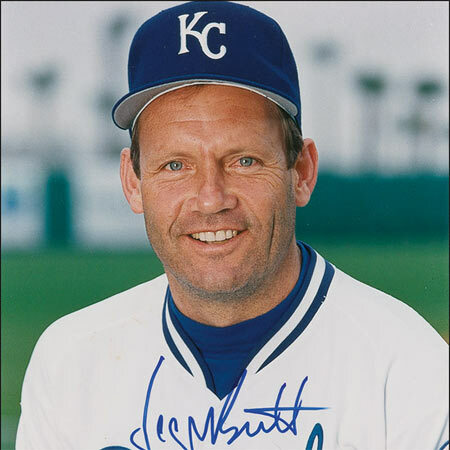 Want to bring George Brett to your next event? Please tell us a little about your event, and we will get back to you shortly!